Another pun! But I will not apologize for this one. 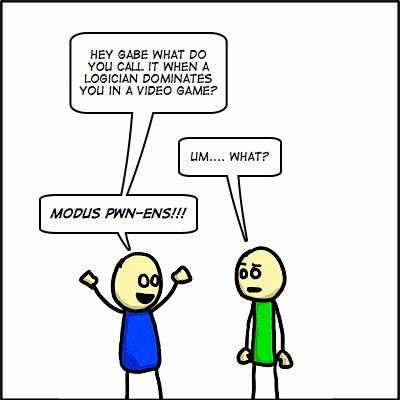 I will own pwn it. Also, three comics in a row? OMG! P.S. – bonus logic pun in the hovertext! Somebody just sent me this… So many… Puns. –Sir Cumference. He acquired his size from too much pi. –but it turned out to be an optical Aleutian . –but he loved her still. –because it was a weapon of math disruption. –and got a little behind in his work. –and was cited for littering. –would result in Linoleum Blownapart. –They ended up in a tie. –Fruit flies like a banana. –The police are looking into it. — Then, it hit me. –was a small medium at large. –is now a seasoned veteran. –In feudalism, it’s your count that votes. –they got a taste of religion. Then it dawned on him!! I used to play under the pseudonym “Reductio Ad Absurdum”. Call me a logic geek. Unfortunately I don’t think many people understood the reference or even what the words mean.